Is it a structural or decorative floor? How much wear will it be subject to? What changes in humidity will it be subject to? Does it have the correct moisture content? Have you acclimatized it to the building? Have you left sufficient movement gaps? What are the main types of wood flooring? Square-edge softwood boards, fixed to support battens with nails or screws. The gaps between the boards will change with changes in moisture. They are normally covered by another material, but sometimes used for a rustic look. Use normal trade stock. Softwood or hardwood tongue and groove boards. They can be secret-nailed (fixed), clipped (floating) or stuck directly to the sub-floor. The boards must be kiln-dried to 8-10% moisture content. Engineered/laminated flooring is more stable than solid wood flooring, as it is made from a solid wood layer bonded to an engineered core, such as plywood. Often recommended for use with underfloor heating, or for areas subject to extreme moisture changes, such as kitchens and bathrooms. Most engineered wood flooring is now designed with a click system that makes installation simple. Use the manufacturer’s recommended underlay. Use directly over a continuous supporting surface, such as a base of concrete, wood or plywood. For most domestic use, any species with a medium or small movement will be fine. For commercial use or for areas with heavy traffic, choose a species with high wear resistance. For underfloor heating, or for areas subject to extreme moisture changes, choose low movement species or engineered flooring (refer to manufacturer’s guidelines). When fixing boards to support battens or joists, choose a thickness of board appropriate to the span of the batten or joist to avoid deflection and squeaking. Open packs and store boards in the room where they will be fitted for at least 24 hrs (48 hrs for hardwoods) to allow acclimatisation, reducing the risk of shrinkage and cupping. Fit directly to joists, or ‘float’ over the existing floor. Use an 8mm spacer block against all walls to allow natural movement (cover gap with a skirting board). Cut round pillars, angles, etc. 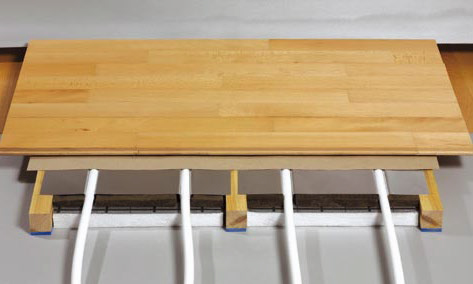 Measure the amount of board you need to cut away, leaving enough room for an air gap. Lay the board on top of the outside row and exactly in its final position. Mark the board where you intend to cut using a Tri square. Glue board ends, not the long sides, if nailing. Consider using a proprietary underlay to reduce noise. Use a hammering block, a punch to ‘secret nail’ through the tongues without damaging the boards and a special tool to fit the final board. Before laying the last row, you may need to cut the board lengthways using a circular saw. Don’t forget to allow a gap between the board and the wall. 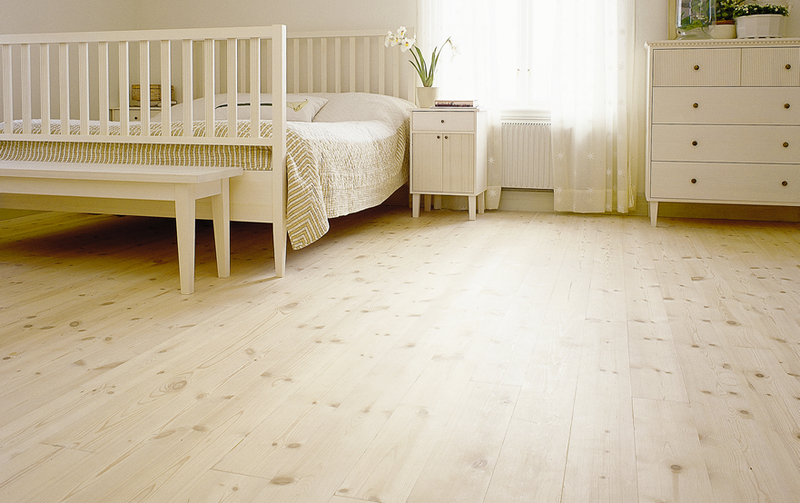 Leave an 8mm gap round solid wood floors to allow for natural movement. Cover with skirting boards. Follow the manufacturer’s guidance. Use engineered timber or species with small movement characteristics. Maximum board widths of 75mm are recommended. 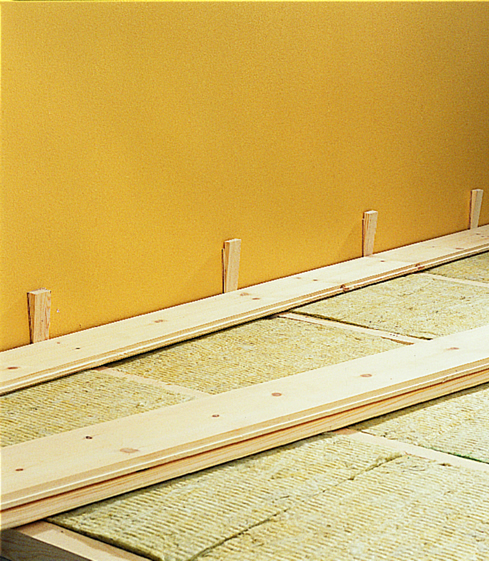 Ensure the moisture content of the boards is 6% to 8% when the floor is laid. Any underfloor hot water or heating pipes should be well lagged.